Speaking of sleep, the other day Jude had just gone down for the night (well, for his first sleep cycle of the night, I should say…he wakes up every two hours to feed. Blake changes his diaper and I nurse, so we get to be up together which is nice) and Blake and I were whispering in bed just catching up on our days and all of a sudden we both stopped and said “WAIT! Jude is sleeping – this is precious sleep time…I’ll see you in a couple hours!” and we both started laughing because apparently nothing is more important than sleeping while your baby sleeps, ha. Jude takes cat naps during the day – unless he’s sleeping on me, then he can sleep for hours. (…And truthfully, I soak up that time and let the dishes and work emails pile up). If I need to get things done around the house or try to snap an Instagram photo, into the front wrap he goes! He’ll sleep so sound in that thing and mama can eat lunch or jump on the computer. However, he quickly wakes up if you stop moving…so I’m often eating lunch or on my laptop while swaying at the kitchen counter haha. As you can see in the photos above, Jude is smiling at us now! (…And is clearly Blake’s twin, ha!). He follows us with his eyes and knows his mamas voice and his dads scent. His reactions to us are the sweetest and has made our bond even stronger. I am SO addicted to my sweet boy! When I go on walks by myself, I’ll look at photos or re-watch videos of him haha…I can’t stay away! He is already lifting his head all the way up during tummy time, nearly holds his head up on his own all the time and has started straightening his legs to hold himself up when we hold him upright on our laps. We keep saying he’s “advanced” haha but I’m pretty sure every parent thinks their kiddo has hung the moon – and we certainly do, too! 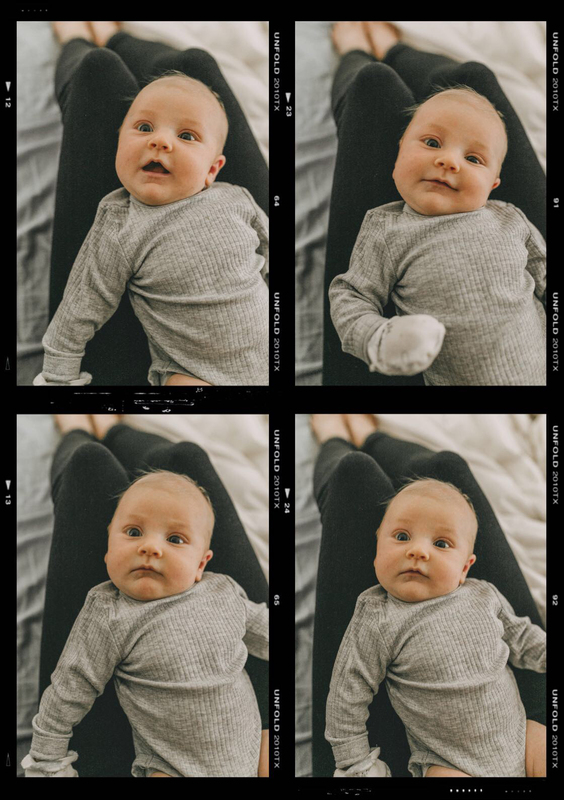 I have a feeling he’s gonna be a strong and fast little guy…he’s already a wiggle worm and likes to be on the move (…which means Blake and I do a LOT of walking in circles around our house day and night). We are definitely getting our steps in over here, ha. Lastly, though he hates getting his diaper changed, the one thing that can calm him is Bob Marley! We’re listening to a lot of reggae lately…(in the bath, diaper changes, while I cook…). Jude pretty much came into the world a super calm baby, and we’re thankful that demeanor has stuck around. He is one happy little man and brings so much joy to our lives! Though motherhood has been wonderful, it hasn’t come without some very personal challenges. To be completely honest, the “baby blues” hit me pretty hard a few weeks in, especially when it came to letting go of work to get used to this new chapter in my life. (I feel like I’ve just started to come out of the fog and figure out a sort-of balance being a working mom). For those who don’t know, “baby blues” affect about 70-80% of new mothers and it’s the lightest form of postpartum depression, caused by hormones (it lasts anywhere from a few minutes to a few hours a day for a couple of weeks). I was experiencing euphoria for the first two weeks after giving birth, but then all of a sudden I started having these major bouts of intense sadness, insecurity and loneliness. I was crying constantly, feeling lost as I navigated this “new self” and sort of grieving my old self in a way. Funny enough, I would cry a lot because I missed Watson haha. Which I think is because he was such a huge part of my “old self” and always by my side as I’d work throughout the day. (Side note: Watson and Lu are still with us! I just mean that I didn’t have time like before to devote to the dogs when we first brought Jude home…). I also think barely leaving the house for a month straight has a lot to do with feeling depressed and isolated – especially with Blake going back to work after two weeks. Seeing him come home feeling fulfilled from his job made me miss my work even more – and especially since my job is also my passion and where I find so much joy and creative freedom. Some days I’d feel really confident I could do it all (keep up blogging and motherhood), the next I’d be sobbing and feel completely confused and exhausted just imagining trying to produce photos, upload, write, edit, etc. while tending to Jude. I should mention that all of these feelings had to do with me, nothing negative or resentful was towards being a mom or being with Jude. Even through the darkness, I wanted to spend all my time with him. It was more about me accepting and learning a new identity and having a new priority when my work has been my focus for the last five years – entering motherhood is a huge life transition. At six weeks and after lots of chats with Blake about how I can continue to have both my work and motherhood, I feel like we finally have a system in place. Blake has been an amazing support through all of these self-doubt filled (and extremely hormonal) moments and I’m thankful he’s so gentle with me…I’d been feeling extra fragile so to be loved without judgement has made all the difference. All that said, sending big hugs to moms who have experienced the baby blues or PP depression. It’s a doozy and a subject that needs to be talked about so we can lift each other up during these hard times! Now that Jude is getting a little older, we’re leaving the house a lot more which has been SO nice. Fresh air and human interaction is a MUST haha. Jude is not a fan of his carseat (…I mean, I don’t blame him, infant carseats kinda feel like straight jackets! ), so oftentimes I’ll run out for a “quick” cup of coffee, only to pull over into a random parking lot because he is crying in the backseat. It’s actually become sort of therapeutic haha…I turn on NPR, nurse him and drink my coffee…then we just hang out until he falls asleep…then back into the carseat and onward towards home we go! 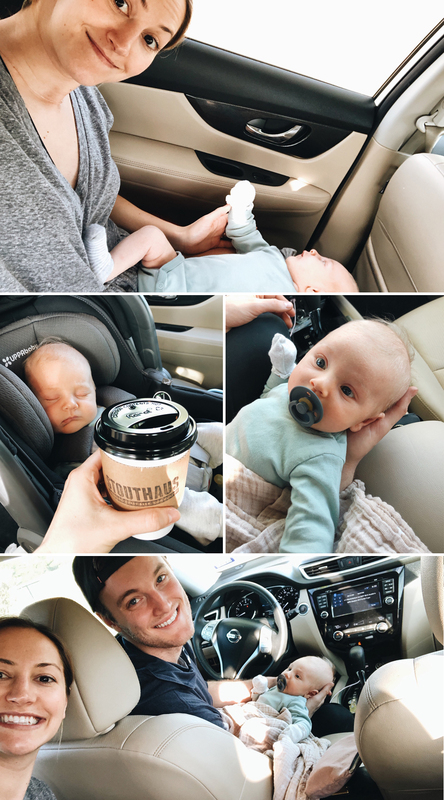 The photos above are from our last coffee run attempt…we ended up pulling into the Lowe’s parking lot for over an hour…Blake even joined us while on his way home from work, ha! Not gonna lie, though it was stressful at the time, these are such awesome memories. We are definitely in the process of learning our new normal and being able to laugh at certain situations has been so much fun. And truth be told, I’m just glad to be out of the house and having a good cup of coffee, ha – it wouldn’t matter where we are!. My mom and sister have also been a huge help by coming over and visiting with me, or holding Jude while I answer emails or snap an Instagram photo. Jude smiles so big for both of them and it’s the cutest thing! Plus, I am so thankful to simply have that social time – it’s such a nice break throughout the day! My mom and sister are so good with babies (my mom has five kiddos, my sister has two) and I have learned SO much from them. It’s also been really cool to hear stories from my childhood about how my mom and dad raised us or tricks they picked up along the way after learning from each baby. I feel like it’s a whole new subject we’ve never discussed and is bringing us even closer. I’m cherishing these days and love to see how much they adore our sweet Jude! At six weeks, Blake and I have gotten into a good rhythm as mom and dad and it makes us so excited to continue to grow our family. We love watching Jude change and develop – honestly we could sit and stare at him for hours (…and we do, ha!). Blake is the best dad…so caring and loving, it’s been pretty incredible to watch him totally embrace this new role. Not to mention he cooks, cleans and helps with Jude throughout the night…he’s superman! It’s so true what they say, motherhood is an indescribable love…to be “needed” the way a baby needs you is just incredible. I feel so complete…like there was this piece of my life I didn’t know I was missing until it was filled by Jude. I am so proud to be his mama! This post got a lot longer than planned haha, but I love to revisit these personal entries and remember all the things, feelings and thoughts. Thanks for reading if you made it this far! PS. 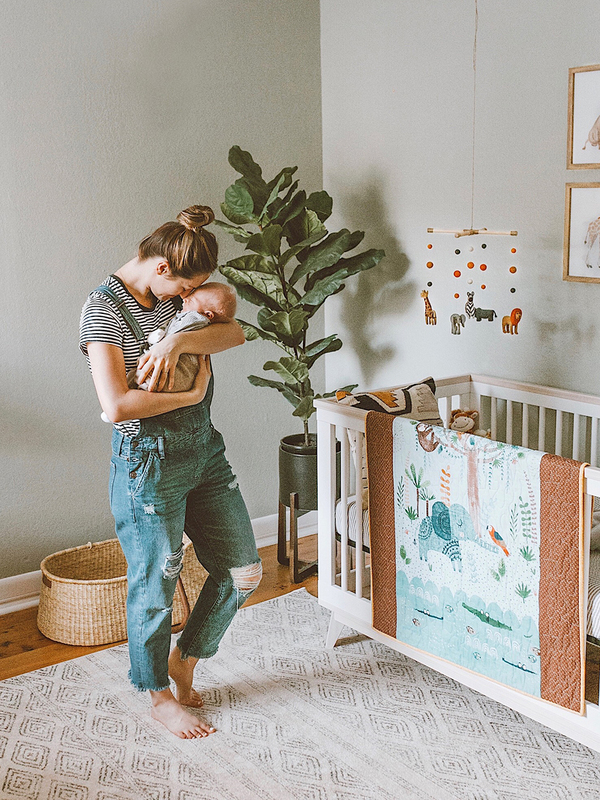 Do you like these motherhood posts? Would love to gage what’s resonating with you guys as time goes on. I’ve got some fun style collaborations in the works for April, so fear not, that stuff is coming back, too! I may have missed this but where are Watson and Lu? They’re at the house with us! 🙂 When we first brought Jude home, Blake took care of the dogs most of the time while I was with the baby and healing. That’s all I meant by I missed Watson – I didn’t have a lot of time like before to devote to the puppers. Six weeks later and things are definitely a lot easier over here! The dogs & Jude are around each other all the time…the beginning was a lot harder when we were getting them used to each other! As first time mom due in July I really appreciate these posts, they’re honest and sweet. Jude is lovely, he’s like mini Blake lol. I will be a first time mom come 2 weeks from now so I really enjoy all your posts about motherhood, baby essentials etc. Great post! I love the honestly. I’m in Austin and a new mama of a 14 week old little guy. Not leaving the house was the hardest for me, especially because I take my pup everywhere! I wish there were more new mom groups in Austin! 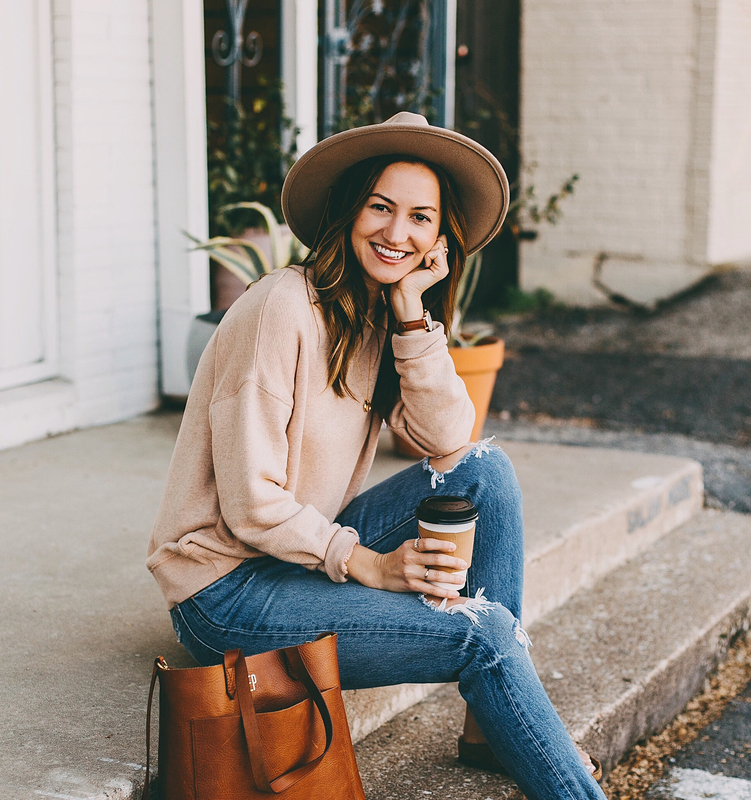 I would love to hear about your favorite spots in Austin for new Moms and babes (and pups of course!). Same! I am a new mama to an almost 10 week old girl. I am always tempted to stalk other mamas in my neighborhood with strollers but don’t want to be a weirdo 😂 CultureMap did a feature on the Peanut app and I’ve had some luck there! Congrats (You look amazing) and Jude is absolutely beautiful, enjoy every moment. Treasure him and the times you hold and cuddle him, they grow up too fast. I’m a 39yr old mother of a 19yr old boy and an 18yr old girl, and I sure miss those days when they were babies! Would you share a “what I eat in a day” blog post soon? I’m pretty sure we talked about this when we chatted, but to actually experience it is totally different. I am glad that your blues haven’t lasted longer than 6 weeks, which is pretty good. It is learning your “new” normal and what works for you. 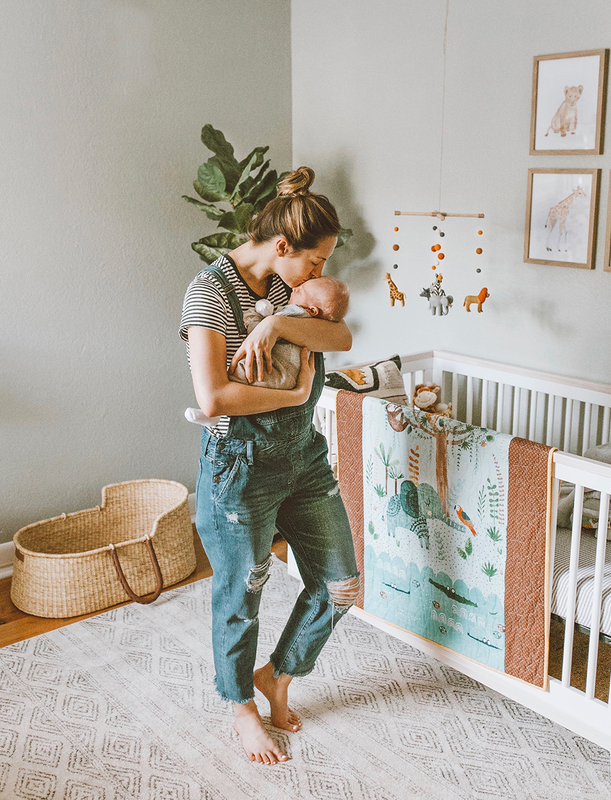 I love these motherhood posts as additional insight into your world. Thank you for sharing with us. I absolutely love these posts! Our little guy is eight weeks old and I faced something similar. I was obsessed with the babe but also missed my job that I love so much. I was used to keeping my days packed with productivity and now I often found my days flying by and very little had been done (besides cuddling). So thank you for sharing!! You’re doing awesome. 1st time mama to be here & I love such an honest post. I’ve also been loving your posts about maternity wear & Jude’s gear! Random, but any recs for a maternity bra? Thanks for your honest post. First time mama here to an almost 9 month old and the transition from your former self to the new you is definitely a hard one. Still figuring it out and I’m sure it will be an ongoing process. Like you I had the baby blues and missed my goldendoodle, Leo and the time we spent just us two. He’s still here and it’s so fun seeing our baby now get so excited to see our pup. Best friends in the making. I found it was helpful to join and mommy and me group with other first time moms and babies similar in age. Nice to have a safe space to vent and make friendships. Congrats on your sweet babe!